What good is it to devote my professional life to understanding nationalism, belonging, community cohesion, conceptions of difference and the like when I have done nothing to prevent the worst thinkable acts of violence to take place in my own country? Especially since I think – or I’m sure – that I’ve felt there was a need for worry (but of course, not to this unconceivable degree…). For several days now I’ve been thinking about how I can contribute. How can I contribute in the best way with my knowledge (of living with difference in Europe), my concern (for the future of us all) and my devotion (to work for a better world)? Responses to the tragedy this weekend have included the massed flying of flags, using flag symbols as facebook identifiers, and so forth. (…) The tying together of national symbols with talk of love reinforces a sense of moral good associated with the Norwegian nation, and reappropriates the nation from racist nationalism. But in this endless tussle between a nation of care and an exclusive people, it seems that racism is the shadow-concept of nationalism. Nationalism is alive and well, and racism continues to creep along in its underbelly. In a country where Social Anthropology is one of the more popular subjects for study at university, and where anthropologists retain a high media profile, the persistence of racist ideologies and acts and their resistance to rational argument raise difficult questions. Norway has produced Europe’s first anti-Muslim terrorist. It seems, however, that the public narrative about him and his actions will not accurately emphasise what is said concerning the direction Norway as a society has taken in the Islamophobic era. No matter how many bombing raids Norwegian pilots conduct in Muslim countries, no matter how many innocent civilians are killed by Norwegian soldiers in the same countries, and regardless of how much the public debate about Muslims and Islam in Norway has been wallowing in the gutter, one thing is clear: We will not face the hatred in our own eyes. 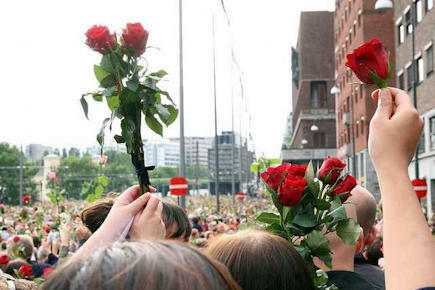 Norway’s extremists don’t tend to gather in visible ‘rightwing groups’. But online, they settle into a subculture of resentment. (…) The fact that Breivik was Made in Norway, a homegrown terrorist with a hairdo and an appearance suggesting the west end of Oslo, and not a bearded foreign import, should lead not only to a closer examination of these networks, but also to a calm, but critical reflection over the Norwegian self-identity itself. The racism and bigotry that have simmered for years on anti-Islamic and anti-immigration Web sites in Norway and other European countries and in the United States made it possible for him to believe he was acting on behalf of a community that would thank him. It is important I think to see how his ideas (but not his actions) not only are derived from bloggers and politicians but also who they resonate with and are grounded on a grassroots everyday level. I also think the Netherlands can give some clues to that and is relevant here since Breivik partly derived his inspiration from Wilders’ Freedom Party ideology. Nice. So even though the only terror attack so far came from the anti-Islamists, PST (Norwegian FBI) does not see much of a threat in them, whereas they believe that Islamists continue to pose the main problem in Norway it seems. It was only a matter of hours between the blast in central Oslo and my most extensive and exhausting engagement with international media since I started out as an anthropologist in the 1980s. Between Friday night and Wednesday, I spoke on radio, on television (via a mobile phone), to newspapers and magazines from China to Chile, and wrote articles for nearly a dozen publications in five countries. My priorities shifted in a matter of hours. Our holiday house was turned into a makeshift media centre, and the computer was online almost 24/7. The more that non-Muslims fear Islam, the more security threats are hyped, the more attention my colleagues and I get. I am in the awkward position of undermining the importance of my own field. My research finds that Islamic terrorism has not posed as large a threat as reporters and the public think. Check also the most recent round-up by Erkan Saka and my first post: Terror in Oslo: Who cares about Christian right wing extremism? stubborn and complete intolerance of any creed, belief, or opinion that differs from one’s own. Bigotry is commonly and publicly flaunted by the very same who love to misuse the word. Will such an actual debate happen? Doubt it, there seemed to be a chance of it for a short while but since then it has been mostly the same mistakes as before at twice the speed and double the force, that has to be a recipe for continued disaster doesn’t it? Such a shame. We’ve all had at least three decades to avoid this and we’re still failing hard, we couldn’t do a worse job at it if we tried could we?